I was hoping to talk today about a tournament over the weekend with my Imperial Guard, but at the last minute things fell apart and I couldn't make it. :( Instead I continued to work in the Blood Angles... and play WoW. Let me tell you WoW is of the devil. The sweet and lovely devil! Here is Dante- a converted version that was handed to me to paint. Not caring much for the original metal version, my friend constructed one out of plastic. 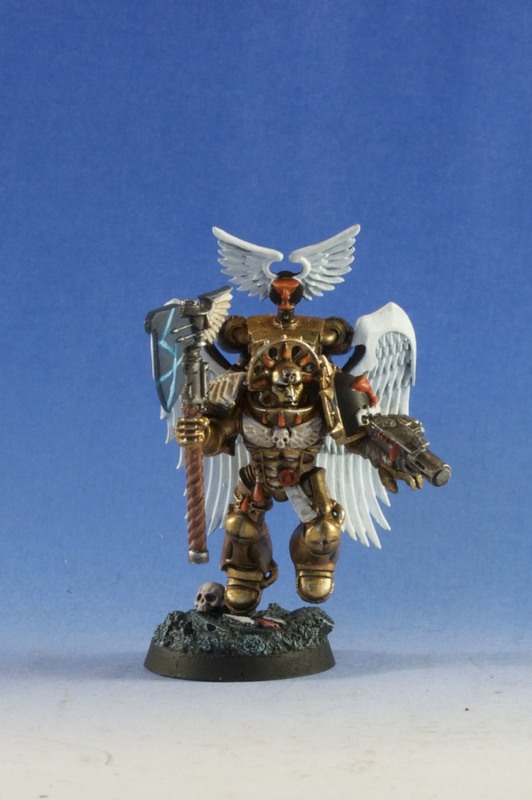 He goes with the rest of the Sanguinary guard very well and was fun to pain. In the games we've played with him, he is a bit of a mystery. He had moderate durability and kill-ability. His ability not to deviate on deep strike is awesome and is probably what makes him pure gold in a deep striking army. I like the conversion, particularly the skull at the base. Nice touch. The gold coloring is looking really nice as well. Oh no, WoW has gotten you to? Once again I'm thankful to have super slow internets, thus making it impossible for me to play those sorts of games. It's not like I make good use of my free time, I just think I'm better off limiting the number of imaginary worlds in which I live for the sake of my sanity. Very nice work on Dante, I like this new version of him a lot. It's cool that he fits in well now with the rest of the Blood Angles' updated look. Any chance you can get a picture of the whole army together? @JJ- Yes, an internet outage at my place would be very handy about now. But that digital world is just so awesome!!! I'll have more and more pictures of the Blood Angels coming soon.